My sermon from the 3rd Sunday after Epiphany (January 21, 2018) on Mark 1:14-20. Listen to the recording at the bottom of the page or read my manuscript below. I want to start by saying something you might not agree with – but I honestly believe that Keanu Reeves might be one of the most talented actors of the last 25 years. Or maybe I hold Keanu in such high regards because he was the star of the first movie I saw in a theater without my parents. 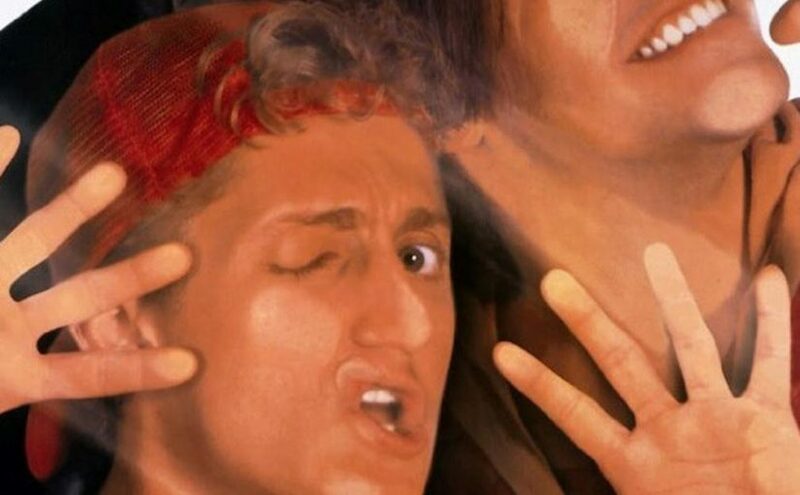 The movie, of course, was Bill and Ted’s Bogus Journey. Bill and Ted are two lovable, if not very smart, teenagers from Southern California who travel through time in a phone booth. Keanu played Ted and I remember being impressed by his 90s slacker style, the hair that hung down and covered half his face, and the fact that he was really good at saying the word “whoa.” The movie is very silly and includes a scene where Bill and Ted recite song lyrics from the 80s hair-metal band Poison to try and convince St. Peter to let them into heaven. It’s a ridiculous film – but it’s my kind of ridiculous. And when my brother and I first saw it, we were in a run-down theater next to the low-rent mall and were literally the only people in the theater. We were kids and we received our own private screening of one of the most ridiculous films ever made. It was awesome and that’s how I met Keanu Reeves. He showed up unexpectedly in my pop culture life, and in the process, I became a fan of his for life. Now, I haven’t seen all of his films and I don’t seek out every interview he gives. But he’s a pop culture icon in my life and I know I’m not the only one who feels this way. He’s made such connection with so many different kind of people that when a picture was posted online showing him sitting on a bench looking sad, literally everyone on the Internet created images and sent him messages trying to cheer him up. When he shows up in our lives, some of us see his work, hear his words, and our one-way connection with him just sort of happens. We become a fan. It’s hard to describe why we become fans. It seems like it’s something we just do. We becomes fans of famous people and not-famous people. We connect in this one-sided way with actors and musicians, and also with colleagues, friends, and even strangers. There are people in this world who we bond with instantly and without effort. And once that bond forms, once we are a fan of them, a part of us, a part of our reality, a part of what we think is possible – actually changes. And that change of reality is part of what Mark is getting at today. Jesus, at the start of this gospel, keeps showing up in unexpected places. He goes to see John the Baptist and is baptized in the River Jordan. Jesus then spends 40 days in the desert, away from everyone. But once John is arrested, Jesus returns to the place he grew up in: the area around the Sea of Galilee. Jesus is taking a stroll on the shore of the Sea of Galilee when he interrupts Andrew and Simon. Andrew and Simon are busy working, tending their nets. I imagine they expected to spend that day seeing nets full of fish rather than meeting the Savior of the world. But Jesus walked straight into their lives, spoke one sentence, and Simon and Andrew dropped everything to follow him. Jesus then walked a little farther, running into Zebedee and his two sons: James and John. James and John, like Andrew and Simon, are busy working. They’re mending their nets so they can catch the fish they need to survive. And James and John are not alone. Some workers and their father are in the boat with them. Now, scripture doesn’t give us any details about Zebedee or his relationship with his sons. We don’t know if they cared about each other or if they had any future plans for their shared lives. James and John might have been the ones Zebedee expected to inherit the family business, pass on the family name, and be Zebedee’s when he became too frail to work. And then Jesus showed up and James and John left their dad in the boat. Any expectations they had about only being fishermen is now gone. Every plan their father had made for them is suddenly undone. This family is sitting by the Sea of Galilee when they meet the Savior of the world and their reality, their expectations, and their future plans all radically change. When Jesus shows up, he expects more than just fans; he expects followers. We might hope and pray that our experience with Jesus might look and sound like what happened to Andrew, Simon, James, and John. We might feel like we’re waiting for that moment when we meet Jesus in a very real and powerful way. We want to see Jesus face-to-face, in a completely unambiguous way, and in a moment where Jesus and life suddenly makes sense and all our doubts and questions finally cease. We’re waiting for a moment when faith will happen to us and we’ll say “woah” like Keanu and actually mean it. We expect Jesus to move us from being only a fan of his – with our doubts and concerns and moments when we don’t even know if we believe – and once we are perfectly faithful, then we can finally be the follower of Jesus we think we’re supposed to be. And I’ll admit that I sometimes wish my faith worked like that. Because that kind of faith, that kind of spirituality, feels like it would be sort of easy. Jesus shows up, I hear one sentence, and I finally get what it means to be with Jesus. Andrew, Simon, James, and John seem to imply that following Jesus is something that happens in a moment. And we who are faithful but a bit doubtful start making assumptions about what made these four disciples change so suddenly. We assume they must have believed everything about Jesus when they first met him, we assume they knew exactly how the story would turn out. We assume that every question they had was, in that moment, instantly answered. But that kind of easy spiritual moment only happens if we end the gospel according to MarI right here. If this was the last thing we heard about Andrew, Simon, James, and John – we could say that faith is supposed to be a neat and simple and very clean. But we will see that the story doesn’t end here. And as we read the rest of Mark, these four will end up being terrible followers of Jesus. They will seek out power and misunderstand what Jesus tells them about humility, sacrifice, and love. They will try to keep the marginalized and vulnerable away from Jesus, failing to see how Jesus makes caring for the oppressed a primary focus of everything he says and does. These four will cross borders with Jesus and fail to see how Jesus wants them to expand what hospitality looks like. These four will even talk back to Jesus when he tells them about the Cross because they couldn’t imagine God making a sacrifice so that all people, regardless of nationality, gender, race, or citizenship in God’s kingdom, could actually thrive. And these four will, when Jesus is in his greatest need, deny and abandon him. These four are not perfect followers of Jesus and Jesus didn’t wait for them to be perfect before he made them his own. Following Jesus isn’t about waiting for that perfect faith-filled moment. Following Jesus is about trusting that Jesus’ promise are true. Jesus doesn’t ask his disciples to believe everything before they follow him. He simply asks them to trust that he is with them. That kind of trust is a little spooky because it assumes we will have doubts, that we will have questions, and that we will sometimes wonder if we even are a fan of Jesus himself. That kind of trust knows we will not be perfect but it still follows Jesus anyways.